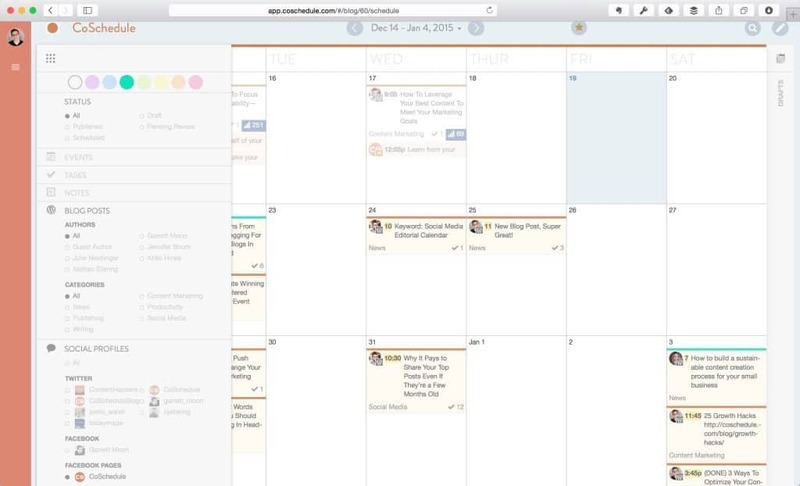 CoSchedule Review: Is This Marketing Calendar Everything You Need? 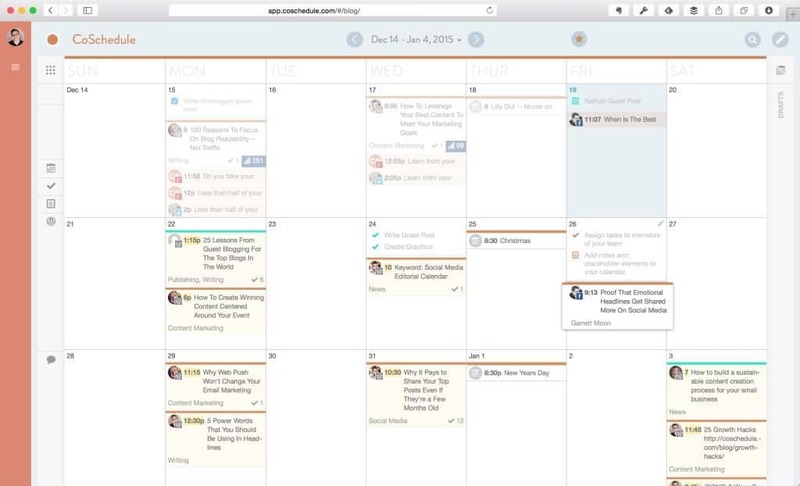 CoSchedule Review: Is This Marketing Calendar Everything Your Blog Needs? My personal take: will I use CoSchedule? I hold these pillars to be the foundations of my blogging strategy. And to make it more convenient for me to do my job, I am always on the lookout for tools to help work faster and better. Blogging productivity is something that I feel strongly about. As much as I want to focus on just writing a post, my attention is also dedicated to promoting and analyzing the posts so I can strategize for the next blog content I will write. With the many tasks I need to do, I devised a system that allows me to keep up with all my blogging tasks. While my system works well enough for me, my desire to get things done faster compelled me to try out CoSchedule. Given the many things people are saying about this tool, I want to see if CoSchedule will help me achieve my goals. Disclaimer: All of the links from this page to CoSchedule are referral links. If you subscribe to a CoSchedule account from any of my links, I will receive a 10% discount for my account. 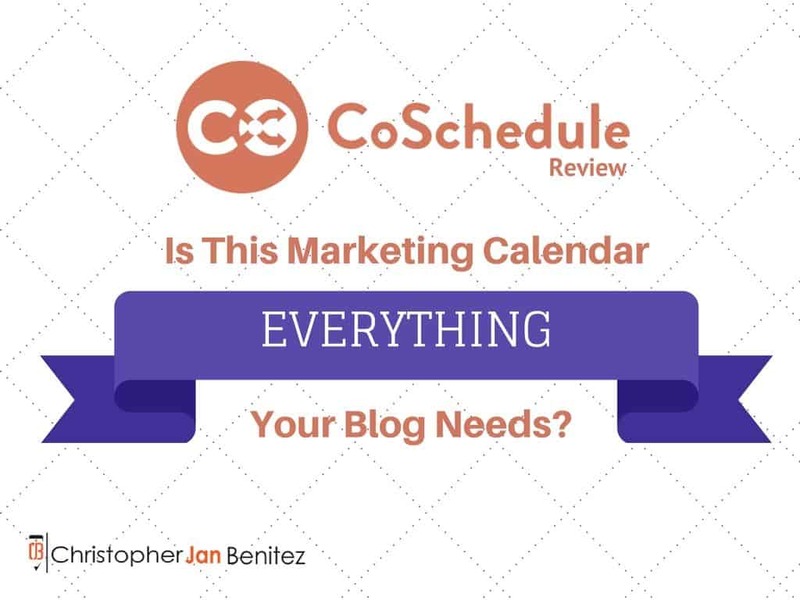 Therefore, if you want to use CoSchedule for your blogging needs, then I suggest that you read the entire review and click on the CoSchedule link found at the bottom of the page. I would appreciate it! Also, this review may grant me a 50% discount from CoSchedule for an entire year. However, I assure you that the CoSchedule review is as objective and unbiased as it can get to help you make an informed decision about the tool. User interface – Is the tool easy to navigate and use? Is there a learning curve that users will have to anticipate when using CoSchedule? Productivity – How much time would I get to save when using this tool? Does CoSchedule make my job as a blogger easier? Cost – Do the features justify the price of the tool? 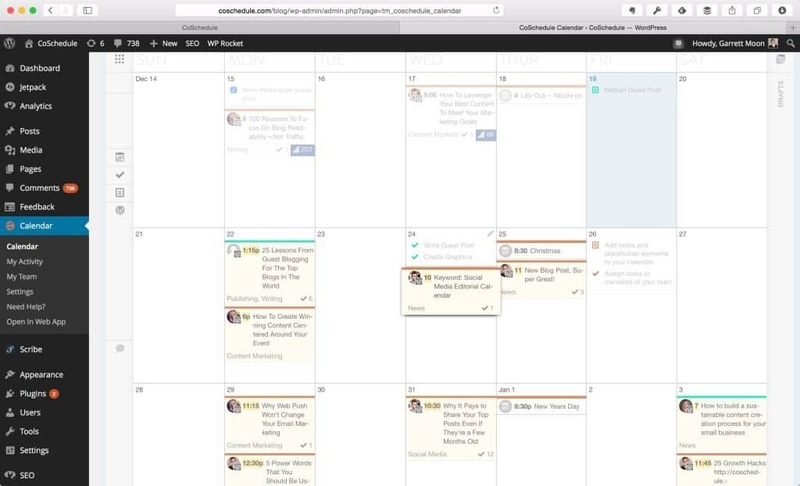 CoSchedule from Garrett Moon on Vimeo. The dashboard provides you the summary of things that may need your immediate attention to keep you up to speed. Below with deal with the other features of CoSchedule, let us jump first into its core function — the editorial calendar. 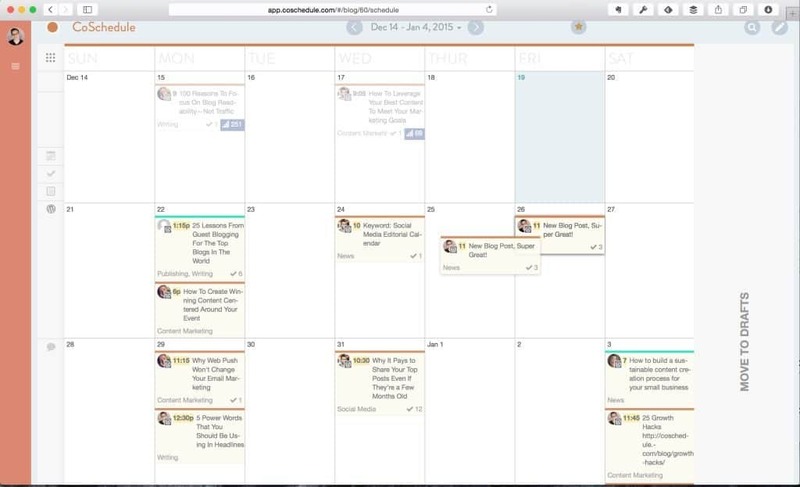 From the calendar, you can manage the posts to be published on your blog. CoSchedule’s drag and drop technology let you quickly move the content to the dates when they should be on the calendar. If you have contributors working with your blog, you can assign them the topics on the drafts so they can write the blog post ahead of time. 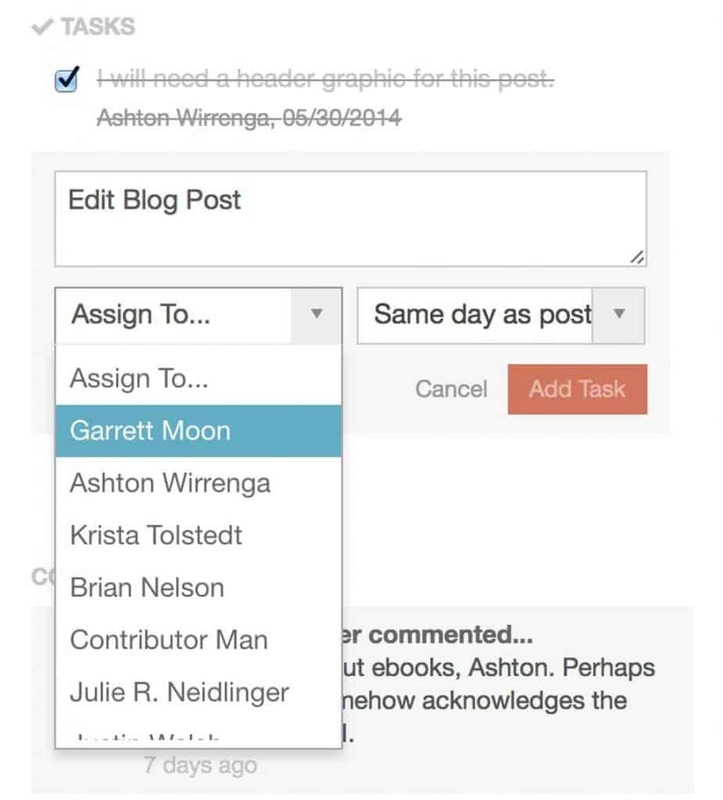 Within each post in the calendar, you can assign tasks the contributors need to do for the post. They can tick off the checkbox if they are done with the task. If you want to inform your contributors about updates, and they want to ask questions about the tasks, you can easily leave comments. If you are looking for drafts assigned to an author or which posts have been published or not, you can filter the search to find what you are looking for. For example, finding the author within CoSchedule will show you all the assigned drafts that s/he has written, published or not. Clicking on a post will show you the total number of social media shares it has received so far. 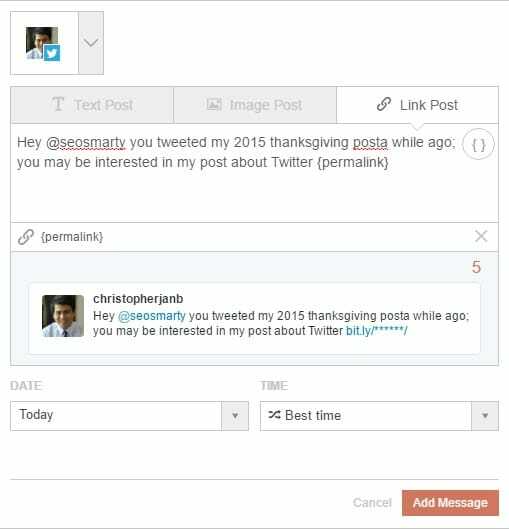 Regarding shares, you can schedule social media messages about your post on CoSchedule. You can set a message that will be shared on Facebook, Twitter, Google+, LinkedIn, and Pinterest at specific times (whether it is after publishing, a day after, a week, or a month). 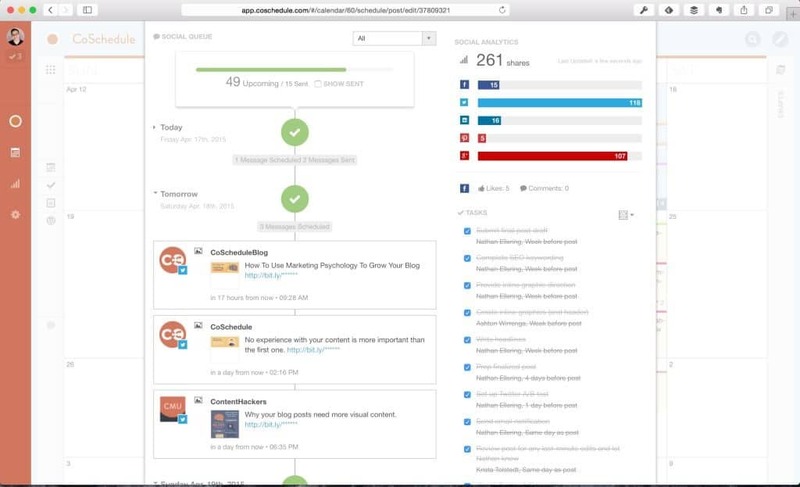 CoSchedule also lets you promote your old blog posts to drive more traffic to each and boost your content’s ROI. As a WordPress plugin, you can also access CoSchedule straight from your blog’s dashboard. 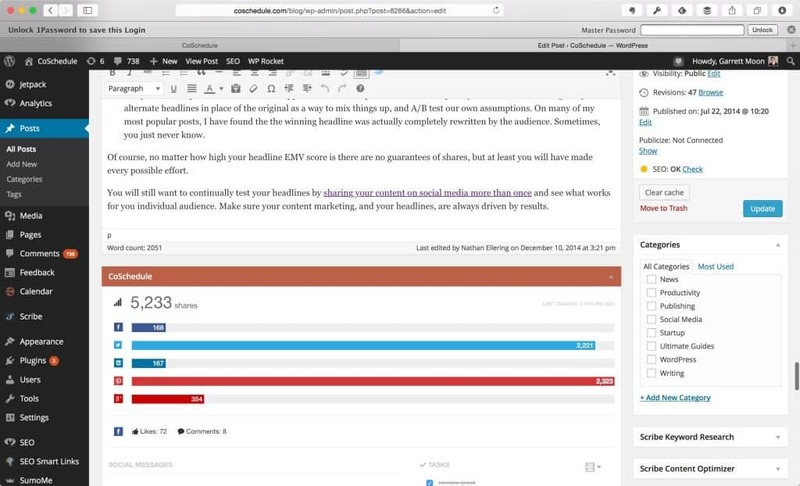 This is perfect for seasoned WordPress users who are already comfortable with using the blogging platform and do not want to move to another one. CoSchedule is available for a 14-day trial period. During the period, you can use all the premium features of the tool so you can a better feel on how it can help you with your blogging task. If you are interested in taking CoSchedule for a test drive, please click here and sign up for an account. There are good reasons why CoSchedule is not simply regarded as an editorial calendar. Below are different ways that I use the tool to increase my productivity as a blogger. 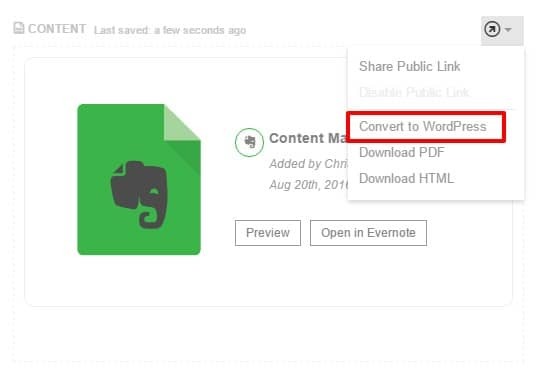 If you or your contributors write your posts on Evernote or Google Drive, you can upload them on your WordPress blog through CoSchedule. For Evernote, you need to you integrate it with CoSchedule to access the notes in your account. Go to the Calendar page and add a content note on a day of your choice. 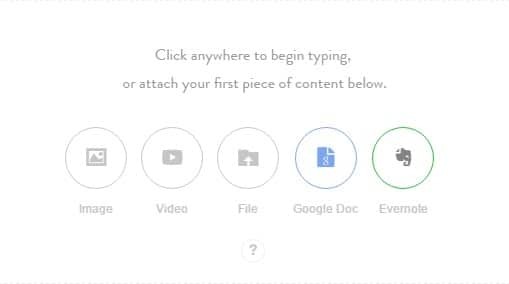 Once you have created the Title for the content, you can easily upload the document from Google Drive or note from Evernote to the tool’s text editor. 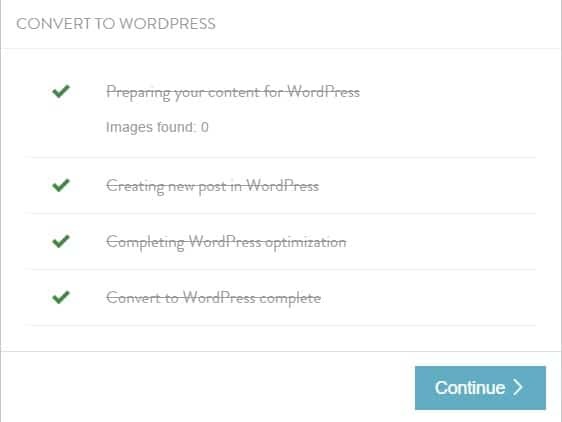 Once you have uploaded the file on the tool, you can convert the file into WordPress for it to become a blog post. Once the conversion is complete, you can edit it like you would a WordPress post. This is a handy feature especially due to malicious attackers stealing your data and corrupting your site. Usually, I write blog posts straight to WordPress, and I do not save my posts in a separate file (although I do use a backup plugin to keep my file safe). CoSchedule encourages me to use cloud apps, so I can store a copy of your post from a secure location and just upload them onto my CoSchedule plugin without formatting them. 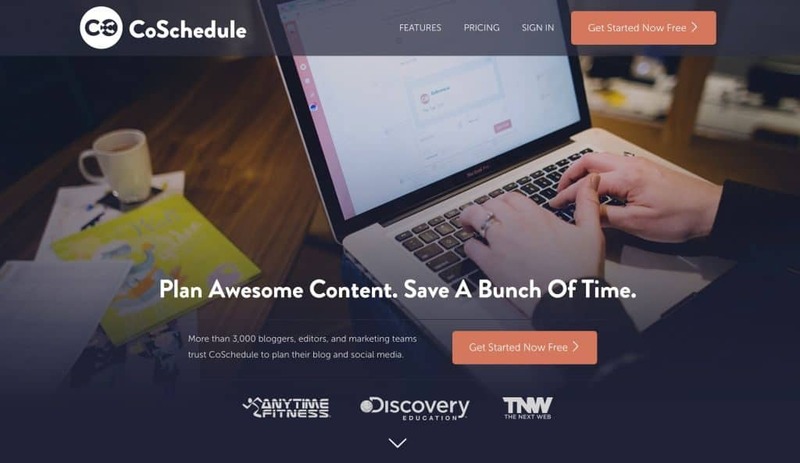 CoSchedule provides you insights to your blog and allows you to leverage your findings into more shares or traffic to your underperforming blog posts. 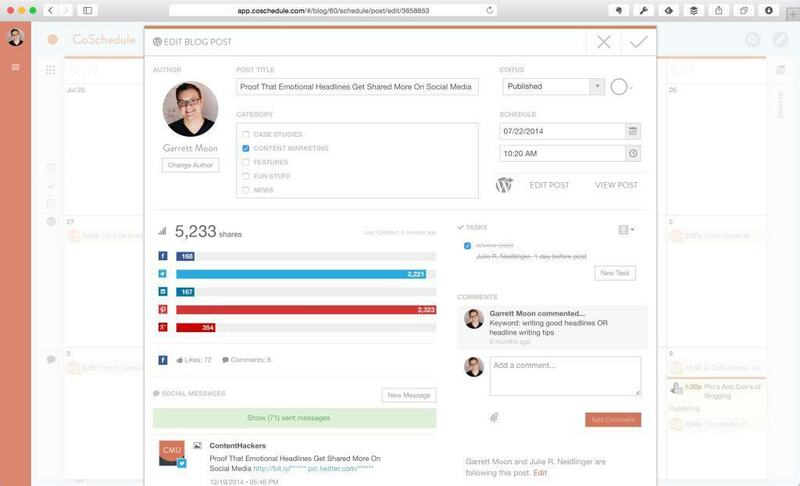 The Top Posts page gives you an overview of the best performing posts for a period based on social shares. This is a screen caps of my most shared blog posts at the time of writing. Sorry, if the share count is all too impressive. Once you determine the post with the most shares, you can dig up an old but relevant posts related with your most shared one. You can then find the people who shared your post on social media using BuzzSumo, get their Twitter handles and tweet them a message about the related post that is not as shared but just as compelling. CoSchedule does not provide the Twitter share count. Since BuzzSumo gives you access to users who have tweeted your post, you can pick off any top post from the list to analyze. 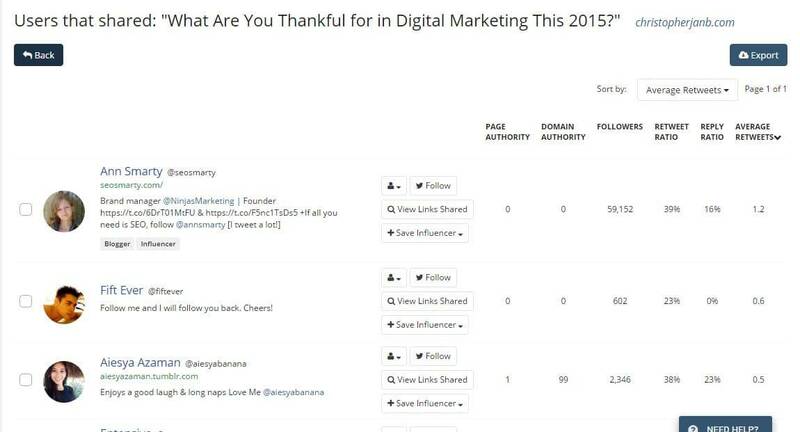 Checking out my currently most shared post, there are 111 Twitter shares that I can tap into to help me share my old posts related to thanksgiving and/or digital marketing. Click on the View Shares to see who these users are. You can create a master list on BuzzSumo of these contacts that you want to share your related posts. Looking back at your Top Posts page, scrape the bottom of the barrel to see posts that have low social shares but are related to your top post. I boxed in red potential posts that I could share to Twitter users who shared my best performing posts. All I need to do now is tweet them with a link to the post from CoSchedule. If you look closely at my link, I use Bit.ly to shorten my links and track the CTR of the links from this channel. This allows me to determine how effective my outreach strategy is. It is not just sharing your content and driving up their share count that’s important — it is also how you get people to click to your post and turn them into avid readers or subscribers. Also, if you want to get the most out of your social shares, you need to schedule your posts during times when your fans and followers are most active. To find out the times in a day when your Twitter followers are online, use Followerwonk. For Facebook, you can check Facebook Insights for the best times to post your status updates so more of your fans will see it. At the moment, I do not accept guest posts and contributions on my blog. But if I do, I can imagine CoSchedule to be a really valuable tool in keeping track of the posts and see if they meet the editorial standards I have set for their content. You can create tasks on the CoSchedule dashboard that can serve as your checklist to see if they meet the requirements you have set for the guest posts. If not, you can return the post back to the contributors to edit until they get it right. As mentioned earlier, this is a great tool to use for keeping up with the tasks and responsibilities of your team, if you are collaborating on a blog with different writers. Instead of using a separate project management tool, you can consolidate all information about your editorial calendar on CoSchedule. While sharing posts on social media, bloggers will normally have to go to the social media platform and post the custom message and link from there. The problem with this process is that you have to undergo multiple steps before being able to post your updates on social media. Some are diligent enough to use a social media management tool to share and schedule the posts on certain dates to maximize the content ROI. However, you would still have to open a new window to get this done. Not to mention, you need to pay for most management tools in order to use their advanced features liked scheduling an unlimited number of posts for promotion. 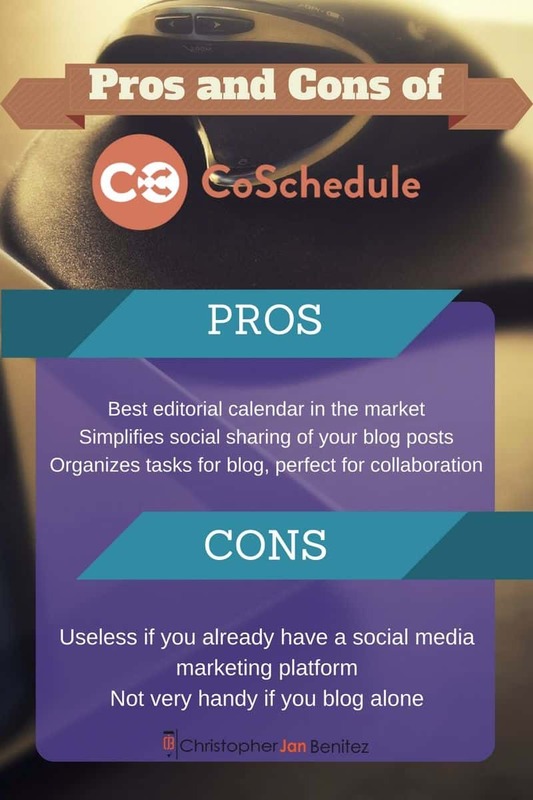 However, CoSchedule takes away the chore from sharing your blog content by being able to schedule the social media posts even before they are published! Social sharing is not limited to your latest posts — you can re-promote your older posts on social media from CoSchedule to drive more blog traffic. 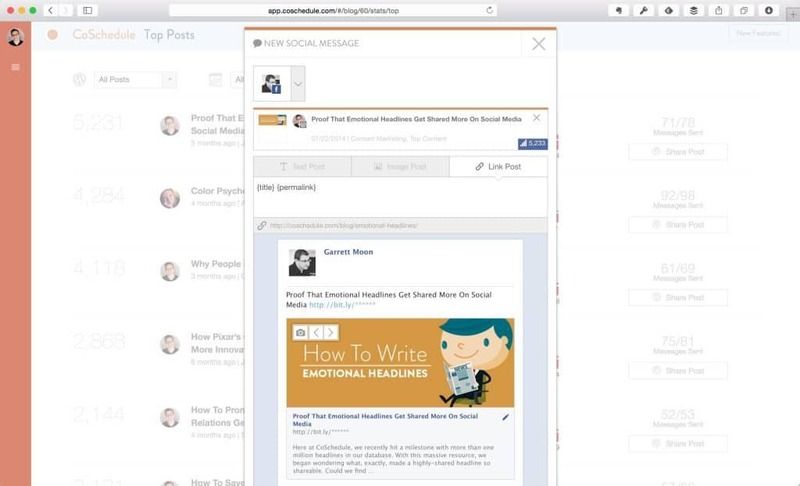 Sharing the posts is easy because you won’t have to open a new window from your browser to use this feature. Just open the post from CoSchedule and scroll down to the bottom of the page to be able to share them at will. Social sharing is a time-consuming activity that blogger worry about. With CoSchedule, sharing becomes a breeze! If you get the schedule of your blog posts mixed up or forget to follow up on tasks for your authors and collaborators, then CoSchedule is the tool for you. Its core product, the editorial calendar, allows you to see the tasks assigned to each writer to develop and schedule on your blog. Create an item from the calendar. 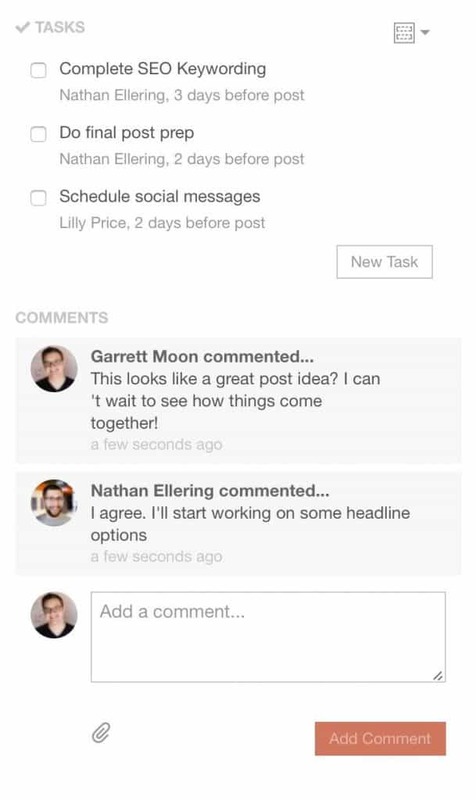 You can color-coordinate and categorize your tasks by type (note, blog post, social media message, analytics, etc.) if you want to organize each for your personal reference. I admire the ability to “set and forget” your social media messages on CoSchedule promoting your blog post even before it gets published. It helps you save more time and allows you to focus on creating content instead of marketing them. Also, re-promoting your older posts to increase their ROI and further boost their social shares is a handy feature to have. However, if you are already using a social media management tool like HootSuite or Buffer like I do, then CoSchedule’s social media features become redundancies. The only advantage CoSchedule has over these platforms is being able to manage content creation and promote in a single place. 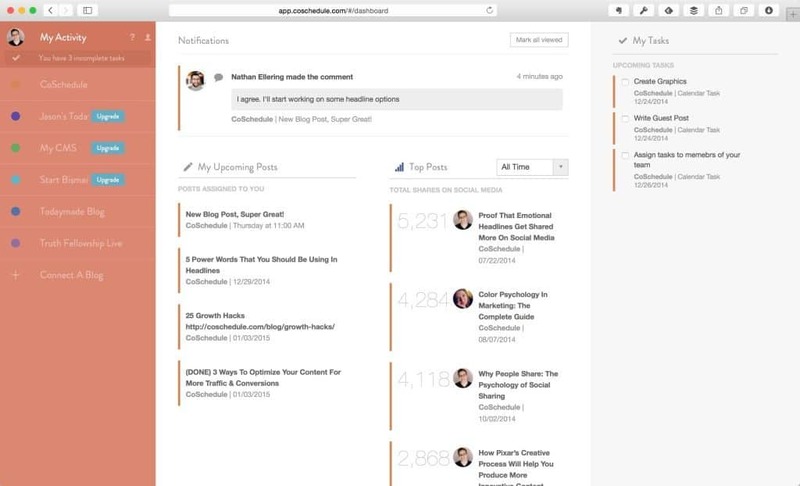 Other than that, social media management tools offer more features that can help you build a following that will allow you to promote your content much more effectively. As the sole publisher of my blog, there is little need for me to use CoSchedule for managing my tasks. As mentioned earlier, I have developed a personal system that allows me to organize my blogging tasks so I can attend to them in an efficient and effective manner. However, I use different tools to get my tasks done, whereas CoSchedule offers me the convenience of handling all your blogging responsibility in one place, which is a big advantage. Nonetheless, I believe in the saying, “if it ain’t broke, why fix it?” Not only does my system works, but it doesn’t cost me a cent to use the tools already my disposal. On a related note, I am not too crazy about its pricing. Below is the pricing for the solo calendar. Below is the pricing for the team calendar. I can see the appeal for the team calendar since managing many people can be a pain and CoSchedule helps mitigate that problem. But for the solo calendar, there are just other tools that provide the same feature (if not more) at a lower price. This is not to say that CoSchedule is a waste of your money because that is far from the case. 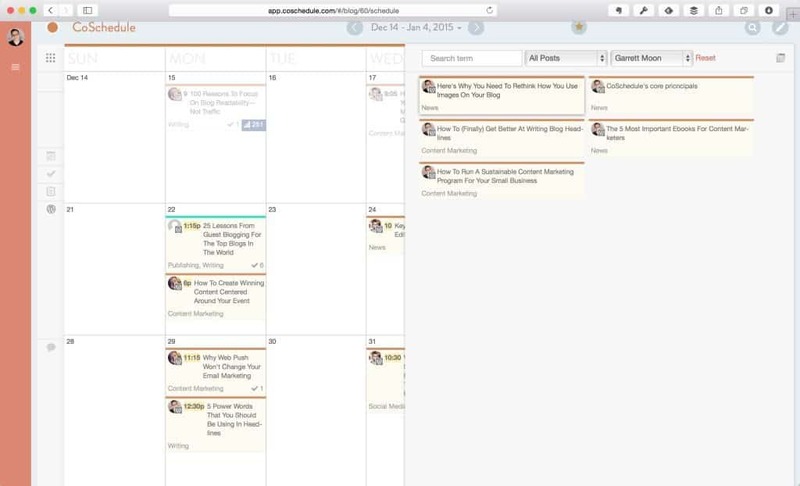 As a productivity tool, CoSchedule lets you save time, which you can use to earn more money. This rings especially true if you are a beginner and want to proceed with blogging in the most convenient way possible. Still, CoSchedule looks like an unnecessary tool for seasoned bloggers who knows their way into developing and promoting content effectively. As it stands, I won’t be using CoSchedule to help me manage my blog for the time being. Given that I believe CoSchedule’s strengths lie in its ability to keep you and your contributors in check with your tasks for the blog and that I do not manage contributors, there is no reason for me to use the tool. Also, its social media features need more tinkering so it can fully help bloggers build a more vibrant following to whom they can promote their content. User interface: 10/10 – Using CoSchedule is a breeze from the get-go. The tool is simply the best editorial calendar in the market with loads of flexibility and options to help you organize your tasks. The myriad of integrations also helps you tie up all your tools into a single place. Productivity: 9/10– Content development and sharing is definitely much easier using CoSchedule and lets you save up more time. My only gripe is the social media feature which, while serviceable in its own right, could be much better. Cost: 7/10 – I strongly feel that CoSchedule works best for blogs with multiple contributors and users. For single bloggers, they might want to test out other project management and social media tools that do more or less the same things (if not more) as well before subscribing to CoSchedule. I would recommend CoSchedule to bloggers who are having a difficult time managing their blog posts and keeping their focus. Bloggers with a fixed system of managing and organizing their blog tasks may be reluctant to switch to CoSchedule because it may not deliver enough to justify the price. Ultimately, the decision is up to you. Thankfully, CoSchedule offers a 14-day trial period for those interested in at least acquainting themselves with the tool and making a decision based on their experience with the tool. The timeframe should be enough to help you test the features and see if it works to your favor. Just click here if you want to sign up for an account and test CoSchedule now.